June (top), Dennis (bottom) and Phil (middle) get cozy. 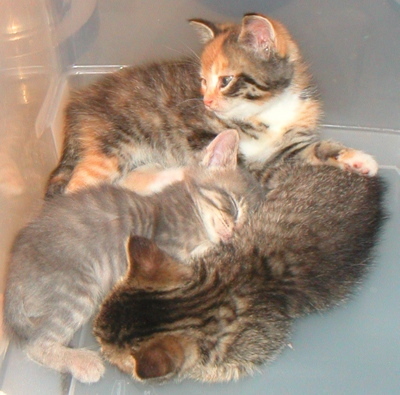 Astute readers may have noticed the “agreed to adopt two kittens” part of this entry. I have to admit that I’ve been cheating on my blog with Facebook. It’s so much easier for the lazy like me to just post a line or two, maybe a couple of photos, than to compose paragraphs and paragraphs and then think of a title. So I have become that reviled, mid-life crisis cliche, cheating on the old with the newer and younger, but unwilling to give up either. Which is why pictures of the kittens are on Facebook, but haven’t been here until now. And I saved the explanation for here, since it will take more than a bon mot and a picture. Long, long ago, about a couple of months ago, my kind-hearted neighbor rescued a pregnant cat. The cat, named Quince and cared for lovingly by Patricia, considerately gave birth on Patricia’s tax return on July 2*. 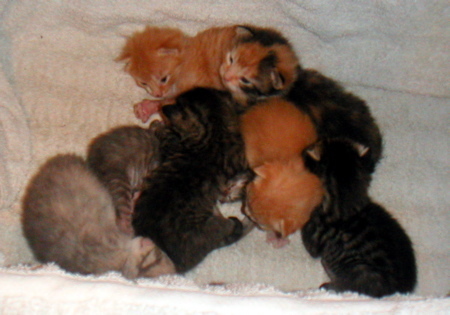 Although tiny, and barely more than a kitten herself (we estimated her to be less than a year old, and she is too thin, although not too rich), Quince gave the world seven, count ’em, seven gorgeous, healthy kittens. A former farmer who lives in my building tells me that this is an unusually large litter for a first try (and believe me, her last – the vet appointment is already made), and that it’s unusual for all the kittens to survive. But survive they did. Patricia is keeping Quince, to whom she has become very attached, and all the kittens are spoken for. I fell in love with June and Dennis (above), and will bring them home for good in a few days. Patricia is letting the kittens leave gradually, so it’s easier on both their mothers. Two, Otis and Phoebe, have already gone to their permanent homes. Fortunately for me, Patricia is in New York on business for a few days, so I get to feed and play with them twice a day until she gets back. Patricia has a lovely, secluded back yard, and it’s delightful to take a cup of coffee and watch the kittens play in the flowers with their mother, or doze in the sun, all snuggled up together. *This happens to be the birthday of a certain lovely Cat, so it’s clearly a good day for cats to be born.